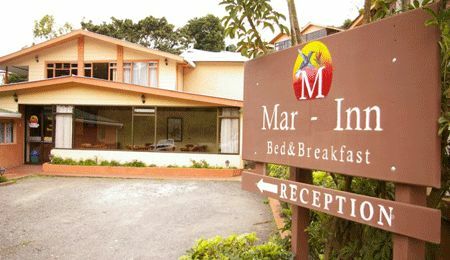 The Mar Inn Bed and Breakfast in Monteverde was built in 1988 and has recently refurbished into a Bed and Breakfast country lodge. The 6 bedroom house now includes ensuite bathrooms, small dinning room and a country kitchen. The Mar Inn Bed and Breakfast in Monteverde was built in 1988 and has recently refurbished into a Bed and Breakfast country lodge. The 6 bedroom house now includes ensuite bathrooms, small dinning room and a country kitchen to enjoy produce from the local area, prepared in own family style. Monteverde Mar-Inn Bed & Breakfast, one of the firsts B & B in Santa Elena Monteverde by Asdrubal Marín and Flora Morera in 1988. It was a Hostel with shared bathroom and only 3 rooms when Monteverde was taking first steps in tourism industry. Mr. Asdrubal Marin and his wife Flora Morera are 100% native of the town, that is why our lodge is named Mar Inn. With extensive development and industrialization of nations across the world, the idea of coming across a Natural Paradise can seem like a yearning for the past - but some destinations, such as the Monteverde Costa Rica, have managed to hold on to their natural beauty, making them a favored choice for travelers seeking a real natural holiday experience. Montevere Cloud Forest has long been a destination chosen by the thousands, the initiatives by the government to boost tourism; it is now attracting a wider range of travelers than ever before. While there may be many reasons for choosing the Costa Rica - from sampling its spa resorts to getting involved in local sustainability measures to combat the threat posed by global warming - one thing tends to unite all visitors: the chance to explore the unspool natural landscape and its national parks. It's no wonder the Monteverde Cloud Forest is such a popular destination among couples, families, friends, adventurers and researchers seeking a dreamy escape for their holidays and other romantic breaks, particularly as many resorts offer the sort of seclusion that would not be possible in more densely populated countries. It isn't just travelers who can appreciate the natural beauty of the cloud forest, which still manage to entrance even the most experienced world travelers, who keep coming back to seek out new experiences opening all the time in Monteverde and other regions. Monteverde has much to offer beyond mere escapism, as visitors will find when arriving to Monteverde a very rural and friendly atmosphere. Home to many natural museums, adventure tours, great home-made food and other attractions extolling the country's history, Monteverde combines the best features of an international destination with the charming and otherworldly atmosphere of a natural eco-friendly haven. Monteverde Mar Inn Bed & Breakfast is located in Santa Elena Monteverde, from downtown 10minutes-walk on the way to the Soccer Field. The public buses in Costa Rica are actually efficient, safe, and incredibly inexpensive. A one way ticket to Monteverde from San Jose costs about $7. 50. You can even bring you surfboard on the bus for an extra $2. 00. The seats recline and are actually pretty comfortable. However, sometimes the buses can be crowded. You cannot buy tickets for the bus in advance; you have to physically buy them at the bus station. Buses leave for Monteverde twice daily; one at 6:30 am, and the other at 2:30 pm. The trip takes about four and a half hours, and the bus does stop for about 15 minutes at a restaurant in the city Sarmientos, which is a little over halfway to Monteverde. If you do not want to have to drive yourself, but do not want to get on a crowded bus, a semi-private shuttle is a good idea. 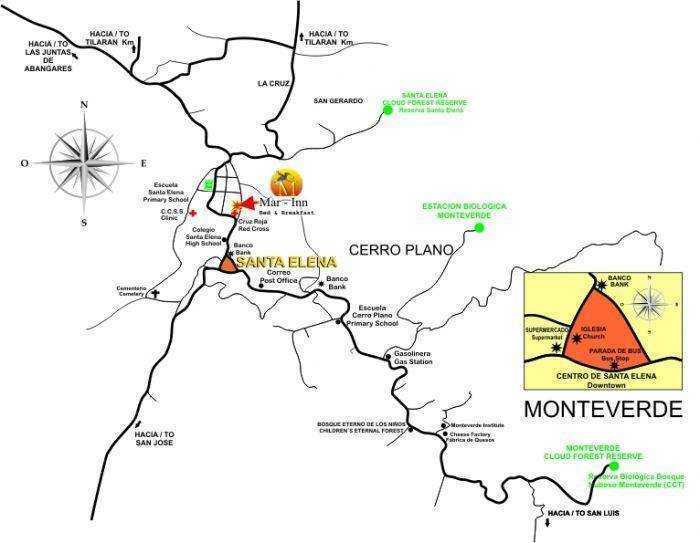 There is one company that provides shuttle service to Monteverde; Monteverde Shuttle Bus. The shuttle is incredibly convenient; it will pick you up and drop you off anywhere, eliminating any need for taxi service. The price ranges from $29 - $45. The fare for children is usually 50% off of the adult price. The shuttles leave from San Jose every day at 8:00 am and 2:00 pm.